On my Herald there is a fairly large gap on both sides of the hood where it meets the rear quarter panel. The hood almost seems a bit short, and subsequently would let rain in (Pic 1,2). I have made a (hopefully) temporary fix involving repurposed seals bonded to some rubber matting (Pic 3). This fix isn't pretty, makes it difficult to put the hood down and isn't going to last long. I was wondering if anybody had ideas on how to fix the issue more permanently. Is there any way to adjust the hood? Could I maybe extend the hood so it makes a seal? Is it possible to purchase material? Due to a lack of funds buying a new hood isn't a possibility. I believe the current hood is a mohair material one. They do this. The hood material shrinks. Only drive it in good weather ! Nick is right they do shrink. How old is the hood? Its not too difficult to fit a new hood, not sure where the best place is to buy a new one now (my last one was from Canley Classics and it fitted very well), you do need to get the frame right, check the joints etc before fitting the hood. BUT best done in the summer or in a heated garage. Nick - I see, I do believe the hood has been on the car for a fair while. Unfortunately Mark that would be difficult, this is my only car! Thanks Mike, that ultimately will probably be the only real solution. It does have the odd small tear or rip I have repaired so would benefit from being replaced in that sense as well. I have heard good stuff about both Canley and Rimmers, but for the mean time I am going to make do with my current hood as the hoods do not come cheaply! I have seen hoods with extra material added there to extend their working life. I think adding material will be the way to go. Any suggestions of where I can buy pieces of material? The hood is navy mohair. That's a shame, I guess the weather takes it's toll. I don't know all that much about hoods, what is a "proper" one? Suggest contacting vehicle trimmers / hood makers local to you and seeing if you can score offcuts. Disappointing as it's only 9 years old and is a "proper" one..
£20 for good oil once or twice a year. £150 for a hood every six or seven ? Any pointers on how to see if it still is the original (I know it is at least 40 years old for sure)? Have a look for writing on the rear screen or Quarter Lights? Give the hood a good wash and wax. Once it is more flexible, I would get a hairdryer and warm it up. This will allow the hood to stretch, and hopefully you can get it to fit. 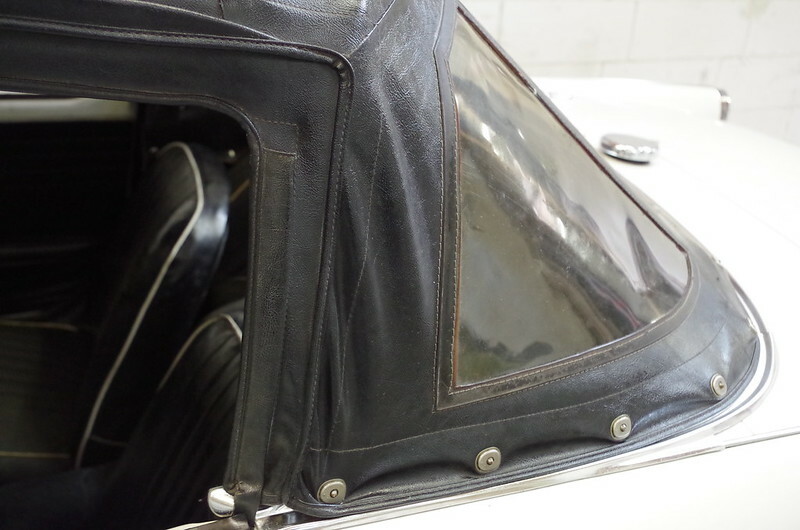 The Herald convertible hood was a quick bodge by the factory and barely fit for purpose. The Herald was after all just an interim model designed on the very cheap and never meant to be built for more than a few years until they made something better. As Dions picture shows, on the TR4, Triumph did it properly. The only way you will get a Herald hood to fit properly so it keeps water out is to modify the upturn on the deck and fit some positive location as per a TR. where the hood clips down to the windscreen top is no better either. Although not perfect I've always found my Herald/Vitesse hoods to be reasonably watertight? EHHHHHHH????? Never heard that one before. Somewhere amongst all of these mega signatures, there might even be a post. The Herald was built as a box of bits on a chassis because Triumph had no access to a press shop to build a unitary body. It was never meant to stay in production very long, just until they could switch to a unitary design - see the Triumph 1300 - a bang up to date FWD unitary bodied car. But so impoverished was the British motor industry in the 60's, the design, like many others, was kept in production well past its sell by date. It was originally intended the car might have a major redesign in the early 60's, see Michelottis prototype, but no money - Triumph was flat broke - and 'its going to be replaced shortly' put paid to that. I'd say the opposite. Compared to contemporary designs the Herald/Vitesse hood frame is very modern, pretty complex elaborate and intended to be quick and easy to operate - which, by and large, it is. Part of that was the elimination of any need to go round clipping or unclipping poppers. Of course, the flip side is that it was fairly cheaply constructed and is more than a little fussy to get set up right (and it's possible to build the cars wrong so the hood frame will never fit properly). Add in a hood that has shrunk, not fitted properly or was never the right dimensions and you get the fairly well known "fits where it touches" effect.